(2009) "Pursuit of Happiness (Nightmare)"
"Pursuit of Happiness" is a song by American recording artist Kid Cudi, released January 25, 2010, as the third single from his debut studio album, Man on the Moon: The End of Day (2009). The song was produced by American electronic rock duo Ratatat and features vocals from American neo-psychedelic act, MGMT. 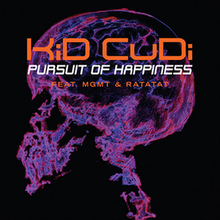 On the album, the track is titled "Pursuit of Happiness (Nightmare)", following the album's dream sequence. The final version of the song was premiered on September 4, 2009, on the DJ Semtex BBC Radio 1 show. The song made its US television debut on the Late Show with David Letterman on September 11, 2009. Cudi later performed the song on September 23, 2009, on Jimmy Kimmel Live. The first music video released, directed by Brody Baker and produced by Josh Hartnett, displays Kid Cudi at a party. While everyone is having a good time, the whole party goes into a slow-motion state. Ratatat does not appear in the video, however MGMT member Ben Goldwasser does make an appearance. Other cameo appearances include Cudi's then GOOD Music label-mate Consequence, along with fellow rappers Johnny Polygon and Drake. The second music video released, directed by Megaforce, shows Kid Cudi waking up and interacting with a swiveling couch, and a party scene. The members of Ratatat are featured. Upon the songs release, American electro house DJ Steve Aoki, produced a remix of "Pursuit of Happiness", which went on to become as popular as the original and became a staple at Aoki's concerts. Steve Aoki released his remix on December 5, 2009. In 2012, the remix was featured on the trailers for the comedy film Project X and was later included on the film's soundtrack. On May 1, 2012, an "Extended Steve Aoki Remix" was released via digital distribution, such as iTunes and Amazon.com. Also in May 2012, Kid Cudi received a nomination for Best Song from a Movie at the MTV Movie Awards, for the Steve Aoki remix to "Pursuit of Happiness", being used in Project X.
Emma Silvers of SF Weekly, called the song a "self-aware 2009 party anthem — or chronicle of a person's thinking as they veer into a drunk and drugged out downward spiral, depending on how you spin it — is a pretty lonely song to begin with." In February 2010, Los Angeles-based electro-pop folk trio Barbara, released a cover version of the song. In early 2010, Australian alternative rock band Cloud Control, covered "Pursuit of Happiness", on multiple occasions throughout their concert tours, which received high praise. In 2010, American folk-rock singer Lissie, began covering the song live in concert. Her cover earned praise from Kid Cudi, who posted the video on his official website, commenting that Lissie did a "great job" and that it was "just really beautiful and extremely flattering." She included the cover on her extended play/cover album, Covered Up with Flowers (2011). In 2012, Los Angeles-based rapper Schoolboy Q, sampled Lissie's cover version, for his song "Hands on the Wheel", taken from his album Habits & Contradictions (2012). In June 2014, Kid Cudi and Lissie performed the song together for the very first time at Le Divan du Monde in Paris, France. In 2013, American rock band Nebraska Jones, also released a cover of "Pursuit of Happiness". In 2014, San Francisco-based indie dream pop musician Katie Day, released a cover version of "Pursuit of Happiness", where she played all the parts solo, supporting her melancholy sing-song with thick layers of drums, synth, piano, and eventually strings (each via keyboard). In September 2017, American rapper KYLE, covered "Pursuit of Happiness", saying he chose to cover the song because it's one of his favorites and it helped him through a dark part of his life: "That song just got me just through a lot of tough times. I think Kid Cudi has this special gift to make music that can pick somebody off from a super dark place and put them in this happy, awesome, positive Pikachu filled place. And I always aspire to do the same thing. It almost taught me like why even I became a rapper in the first place." In 2010, the remix composed by Steve Aoki was featured in a Vitamin Water commercial, in which NBA athlete LeBron James narrates and stars in. The original version of the song was included on the soundtrack to the 2011 film Fright Night. In 2012, the Steve Aoki remix was featured on the trailers for the comedy film Project X and was later included on the film's soundtrack. Aoki's remix is also heard in the 2014 superhero film, The Amazing Spider-Man 2. Lissie's live cover of "Pursuit of Happiness", was included on the soundtrack to the 2013 comedy-drama film, The Dirties. In August 2016, Nike, Inc. used Lissie's cover version of the song for their "Unlimited Pursuit" commercial. The commercial, produced by Los Angeles advertising agency Dirty Robber, features Olympic athletes such as Serena Williams, Gabby Douglas and Simone Biles. Starting in October 2017, the Philadelphia Flyers began using the Steve Aoki remix of the song as the first part of their goal song mash-up. "Pursuit of Happiness" debuted and peaked on the Billboard Hot 100 at #59 on the week ending October 3, 2009. The following week, it fell 41 spots to #100. The song recharted at #95 on the week ending January 8, 2011. It has now sold over 2,000,000 downloads since its release. The song originally peaked at number 137 on the UK Singles Chart, but it re-entered the chart in 2012 attaining a new peak of 72 and entered for the first time on the Irish Singles Chart, peaking at 24. In 2012, it has also charted for the first time in Austria, Belgium (Wallonia), France, Germany, Netherlands, Sweden and Switzerland. ^ BBC - 1Xtra - Semtex Kid Cudi on BBC Radio 1Xtra with DJ Semtex. ^ Illy (23 September 2009). "Video: KiD CuDi – Pursuit Of Happiness (Jimmy Kimmel Live)". youheardthatnew.com. ^ "Kid Cudi - "Pursuit Of Happiness" (Steve Aoki Remix)". Pigeons & Planes. ^ "Pursuit of Happiness (Steve Aoki Remix)". The Chuckness. ^ "Pursuit of Happiness (Extended Steve Aoki Remix) feat. MGMT & Ratatat - Single by Kid Cudi". iTunes Store. Apple. Retrieved March 14, 2013. ^ "2012 MTV Movie Awards Winners: The Full List". MTV News. ^ a b "The Wonderful Lissie's Cover of Pursuit of Happiness". Archived from the original on July 13, 2011. Retrieved August 6, 2010. ^ Monger, James. "Covered Up with Flowers > Overview". Allmusic. Rovi Corporation. Retrieved 2012-06-06. ^ "Watch Kid Cudi and Lissie Perform 'Pursuit of Happiness' Together - MTV". MTV News. ^ Zach Frydenlund. "Watch Kid Cudi and Lissie Perform "Pursuit of Happiness" Live In Paris". Complex. ^ "Watch KiD CuDi & Lissie Perform "Pursuit of Happiness" In Paris". HYPETRAK. ^ "Fright Night (2011)". IMDb. ^ "The Amazing Spider-Man 2 (2014) Soundtracks". IMDb. ^ "Kid Cudi Featuring MGMT & Ratatat – Pursuit Of Happiness". Discogs. Retrieved February 27, 2016. ^ "Pursuit of Happiness (Extended Steve Aoki Remix) [feat. MGMT & Ratatat] - Single". iTunes Store (US). Retrieved February 27, 2016. ^ "Pursuit of Happiness (feat. MGMT & Ratatat) [International Version] - EP". iTunes Store (GB). Retrieved February 27, 2016. ^ Grein, Paul (March 6, 2013). "Week Ending March 3, 2013. Songs: Is The Right Song #1?". Chart Watch. Yahoo Music. Retrieved March 14, 2013. ^ "Australian-charts.com – Kid Cudi feat. MGMT & Ratatat – Pursuit Of Happiness". ARIA Top 50 Singles. ^ "Austriancharts.at – Kid Cudi feat. MGMT & Ratatat – Pursuit Of Happiness" (in German). Ö3 Austria Top 40. ^ "Ultratop.be – Kid Cudi feat. MGMT & Ratatat – Pursuit Of Happiness" (in Dutch). Ultratop 50. ^ "Ultratop.be – Kid Cudi feat. MGMT & Ratatat – Pursuit Of Happiness" (in French). Ultratop 50. ^ "Pursuit Of Happiness (nightmare)". acharts.us. ^ "Lescharts.com – Kid Cudi feat. MGMT & Ratatat – Pursuit Of Happiness" (in French). Les classement single. '^ "Club 40" (in French). club40.fr. In the box under Afficher le classment du week-end du, select "27/07/2012". Retrieved August 23, 2014. ^ "Offiziellecharts.de – Kid Cudi feat. MGMT & Ratatat – Pursuit Of Happiness". GfK Entertainment Charts. Retrieved February 21, 2019. ^ "Chart Track: Week 11, 2012". Irish Singles Chart. ^ "Dutchcharts.nl – Kid Cudi feat. MGMT & Ratatat – Pursuit Of Happiness" (in Dutch). Single Top 100. ^ "Swedishcharts.com – Kid Cudi feat. MGMT & Ratatat – Pursuit Of Happiness". Singles Top 100. ^ "Swisscharts.com – Kid Cudi feat. MGMT & Ratatat – Pursuit Of Happiness". Swiss Singles Chart. ^ "Official UK Singles Top 100 - 19th January 2013 - The UK Charts - Official Charts Company". Official Charts Company. 23 December 2012. Archived from the original on 23 December 2012. ^ "Kid Cudi Chart History (Hot 100)". Billboard. ^ "ARIA Charts – Accreditations – 2013 Singles". Australian Recording Industry Association. Retrieved February 21, 2013. ^ "Gold-/Platin-Datenbank (Kid Cudi; 'Pursuit of Happiness')" (in German). Bundesverband Musikindustrie. Retrieved May 1, 2018. ^ "British single certifications – Kid Cudi – Pursuit of Happiness". British Phonographic Industry. Retrieved July 20, 2018. Select singles in the Format field. Select Gold in the Certification field. Type Pursuit of Happiness in the "Search BPI Awards" field and then press Enter. ^ "American single certifications – Kid Cudi – Pursuit of Happiness (Nightmare)". Recording Industry Association of America. If necessary, click Advanced, then click Format, then select Single, then click SEARCH. This page was last edited on 21 March 2019, at 01:14 (UTC).